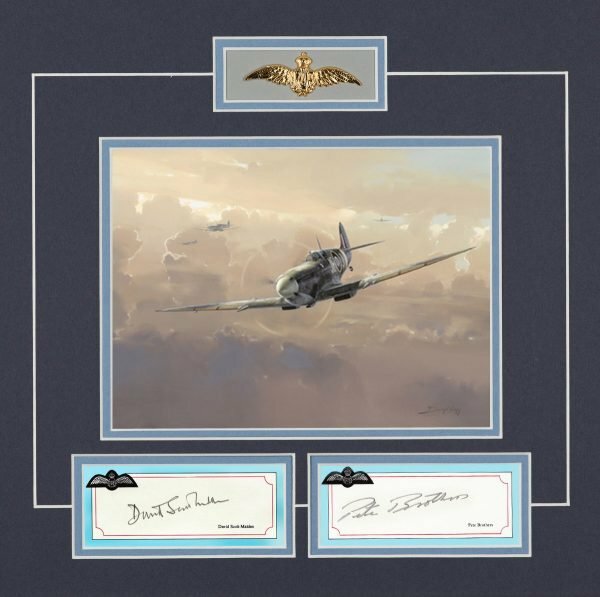 Signatures of TWO famous fighter pilots from the Battle of Britain. Both flew operationally throughout the heaviest fighting of the campaign surviving to become legendary, highly decorated fighter leaders. A valuable collector ensemble. Pete Brothers first saw action over Dunkirk in May 1940 scoring his first victory – an Me 109 destroyed near the beaches. He then flew through the thick of the Battle of Britain, first with 32 Sqn then as a flight commander with 257 Squadron at Martlesham with Bob Stanford-Tuck. Meanwhile David Scott-Malden flew Spitfires in 12 Group’s Duxford Wing under the leadership of Douglas Bader. The air fighting raged at a blistering and unrelenting pace.